Marco Montemagno, an Italian new media communication expert, entrepreneur and blogger, who has worked and collaborated with some of the most established media corporations including Italy's RAI and Murdoch's Sky TV network, has just published online a notable P2P manifesto, in which he shares his uncensored view of what the majors (established media) should expect from P2P and its unstoppable growth. Montemagno central tenet is that P2P is unstoppable, good, useful, effective and a major disruptive technology able to breach into the oligarchy of established media business. "Quantity and quality of P2P technologies are inversely proportional to the numbers of lawsuits issued to stop P2P"
In Marco Montemagno's view P2P is such a major disruptive and powerfully positive technology that it needs to be taken into serious consideration now. 1) P2P it's a revolutionary and technically unstoppable technology. 2) P2P is positive for companies. 3) P2P is good for the market. 4) P2P is good for users. 1) P2P is a revolutionary and unstoppable technology. Distributed file sharing and the advent of extremely efficient content delivery and distribution protocols like BitTorrent (the latest and most effective P2P file distribution approach) make Peer-to-Peer networks the new frontier of publishing, marketing and content distribution. Make no mistake in assuming that the early connotations and typical uses of popular P2P tools/networks represent strong indication of where and how these technologies will evolve. In other words: P2P file sharing is not for (only) for sharing music or underground movie clips. This is only our early, ignorant, spontaneous and naive use. With no serious and unbiased research about P2P, cooperation and virtual collaboration how are end users supposed to appreciate and find out about some other intelligent uses for these tools? Though you may not see it, if you are eyes are fixated all day long on your browser and email application, a vast number of people (some tens of millions at this very time) is actively seeding, sharing, searching and downloading all kinds of content (text, audio, video, photos, etc.) 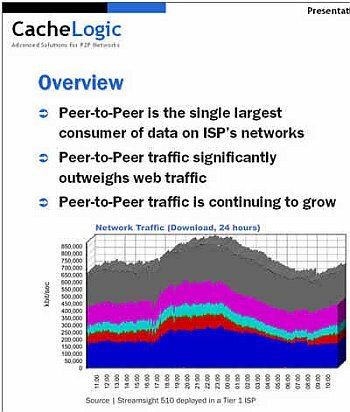 from P2P file sharing networks. The amount of data now exchanged on P2P networks is about equivalent to a full third of all present Internet traffic. These P2P networks/tools are accessible from any type of computer, and more and more frequently also by other types of media devices like PDAs and smartphones. Nonetheless the established media industry thinks that valuable content, copyright and the right to be fairly compensated can be achieved through the use of control technologies that permit content distributors to limit, meter and revoke access to digital content (DRM), these industries are fighting a losing battle. "any digital content available on a network, that in order to work/be utilized, needs to share data (as it is the Web), is shareable itself." "DRM systems are usually broken in minutes, sometimes days. Rarely, months. It's not because the people who think them up are stupid. It's not because the people who break them are smart. It's not because there's a flaw in the algorithms. At the end of the day, all DRM systems share a common vulnerability: they provide their attackers with ciphertext, the cipher and the key. At this point, the secret isn't a secret anymore." Today, for the first time, any new player (you?) can step into the media business thanks to P2P technology, produce music, video (and all the other kind of multimedia content), become profitable, all while adopting P2P technologies to distribute her content via the Internet. "File sharing will evolve to social sharing, a context in which the exchange of data it will comprise hundreds of other sorts of data exchange marketplaces (contacts, bookmarks, jobs data, etc)." At that point, "it will not be possible anymore to control the P2P data exchange", as billions of data exchanges take place every minute, from all possible locations and in ways and fashions that are being experimented up to this minute (mesh networking technologies and similar ones). Tracking the P2P data sharing will become next to impossible as the channels, formats and technologies that will allow this will proliferate like fungi. Why P2P is positive for the market? Because scarcity of content, delivery channels and media sources is gone. We now have unprecedented freedom of choice. "The point is this: The media business was built on scarcity. Scarcity of spectrum. Scarcity of hits. Scarcity caused by copyright and limited shelf space. Consumers hate scarcity. But you and I know that monopolists love scarcity. When consumers have fewer choices, a monopoly thrives. Scarcity made it easy to get fat and happy. But almost overnight, the scarcity on which you built your media monopolies started to disappear. ...Here's the problem: You monopolists appear to believe that you have a right to business as usual. You believe that if the rules of the marketplace change, it's not fair. You believe that you somehow deserve the private planes, the great parties, and the obscene profits. You also seem to think that if your monopoly were to go away, so would all of the good ideas." Smart content producers understand that their business is in a new era. And they adapt to the new environment scouting for new, unthought of opportunities and new business models. P2P has opened new business scenarios. Look indeed at the impressive list of the non-infringing applications and uses already out there. You will be surprised. Skype is the most spectacular example, but so is Groove and many others are coming. the only limit is imagination. According to Montemagno. future P2P "file networkers" (or as I would call them ShareMasters) will become a very important media business authority, playing the role of high-quality, specialized clearinghouses to niche contents and to specific social networks of people. ShareMasters or P2P file networkers will play the role that newsmasters have in the RSS universe, by positioning themselves as uniquely valuable information hubs on specific industries, topics, themes. What today we call file swappers may become the most wanted "sharemasters" of the tomorrow. And paradoxically in Montemagno's view, these very same "sharemasters" may become the best and most desired allies of the old media guard. "How many files are you able to share? The information that today characterize a "criminal", tomorrow will characterize the "go to guy" of Media business." P2P networks offer tremendous opportunities to information, service and media companies by providing new and untapped delivery and distribution channels that provide efficiency, performance, rich and complete fault-tolerance. P2P networks provide also the ideal marketing and distribution channel for many services, information products and tools, leveraging the power and reach of each individual in the network the maximum. P2P networks offer to any online company a direct, permanent, unmediated, highly efficient communication channel with their customers. And each and every individual that is a customer can become one more marketing agent in the infinite revolving loop that P2P networks are. Viral marketing at its best. "For this reason many Linux distributions are already offered via P2P (Debian, Gentoo, Knoppix, Fedora/RedHat, Ubuntu, Dynebolic, Mandrake, Slackware, WhiteBox, etc. ). These small commercial companies would have met otherwise enormously higher costs if they had been distributing in traditional ways, by using DVDs and FTP downloads, the large quantities of software data they need to provide to each customer. P2P saves resources and significant amounts of money to these companies while opening new opportunities for content delivery and distribution. The Coral project is a great example of P2P use that well showcases the powerful advantages that can be provided with this technology. The Coral project is "a peer-to-peer DNS layer that transparently redirects browsers to participating caching proxies, which in turn cooperate to minimize load on the source web server. These volunteer sites that run Coral automatically replicate content as a side effect of users accessing it, improving its availability." This is the kind of project (others will come soon), that can save any company a huge amount of money. If your emerging online business needs to deliver and distribute rich media files, audio and video recording in digital format over the Internet, this technology may indeed save you tons of money. 4) P2P is good for the users. Ours is a shared future. "Sharing, is an attractive activity because gives the P2P users: autonomy and freedom. Autonomy to decide what to share with others. Freedom to do it." P2P is in fact is the technological enabler transforming normal users into individual media centers. While today, the media world is deeply being transformed, normal individuals can start to create their own news, music, video, TV show and distribute it around the world from their laptop. If we also eliminate the frustrating limitations of bandwidth, hosting, and easy access what is there to stop this wave? Users will become the media themselves. Remember: freedom and autonomy are priceless for the users. And P2P key characterizing traits are providing maximum freedom to share, and total autonomy of decision. P2P is here to stay. Original article "P2P Manifesto" published January 16th by Marco Montemagno.